MAGic Pro Scripting Edition is the world’s first screen magnification software that allows users to write their own scripts to modify its operation in any application, providing greater usability. 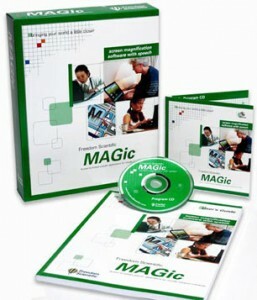 What makes MAGic Pro Scripting Edition different from MAGic Professional with Speech? MAGic Pro Scripting Edition is pre-authorized for remote access, using Citrix and Terminal Services, and it also includes the ability to create and run custom scripts. By using scripts, you are able to modify MAGics behavior in any application, increasing flexibility and enhancing productivity. T&T Consultancy, developers of J-Say are creating a MAGic version to combine MAGic with Dragon” Naturally Speaking®. Any current version of MAGic can easily be upgraded to the MAGic Pro Scripting Edition through Internet License Management (ILM). Once authorization is updated, the new functionality will be immediately available for use. The scripting functions traditionally used by JAWS have been expanded to provide new functions for directing visual focus and utilizing MAGic-specific features. The thousands of scripts previously written for JAWS can easily be modified to include MAGic functionality.